Is a son of one of the founders of the famous Allan Line, and with his brother, Mr. Claud A. Allan, also a prominent Clyde yachtsman, carries on the shipping business of Messrs. R. and C. Allan, of Glasgow. Mr. Allan has been connected with yachting for a considerable number of years, and he maintains a small vessel for racing and a steam yacht for cruising purposes. He owns the s.y. Torfrida, built by Messrs. John Elder and Co. During the past fourteen years he has had a small fleet of clippers, ranging from the 10-rater Rosetta to the 19-footer Estrella, one of Mr. Alfred Mylne’s successful boats. He also owned Timsah (2½-rater, by Nicholson), Vanda (1-rater, by Watson), Moti (19-footer, by Linton Hope), and Zitella, Shireen, and Estrella, all 19-footers, and all by Mylne. Mr. Allan, when possible, sails his own boat, and he has had a gratifying measure of success during his career. The noted Clyde Corinthians, Mr. R. G. Allan and Mr. Bryce Allan, the former or whom has taken part in the winning of 429 prizes (no fewer than 396 of them in boats of his own), are cousins of Mr. R. S. Allan, whose daughters are also very fond of yachting, both cruising and racing. Mignon, Cutter. Mr. E. F. Patterson. 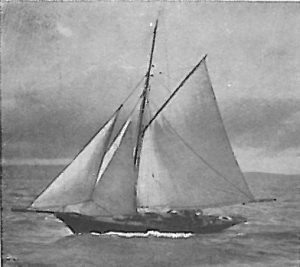 Miss D. K. Allan is one of the most accomplished small-boat sailers on the Clyde, and during the past three years has sailed fifty-three races and won thirty-two prizes in her own cutter, the Mignon. Mr. Allan has been Vice-Commo­dore of both the Royal Largs and the Clyde Corinthian Yacht Clubs for a number of years, and his yachting headquarters have been made at Hafton House, on the shores of Holy Loch. Clubs: Royal Clyde, Clyde Corinthian, Gourock, Holy Loch, Royal Largs, Royal Northern, Royal Western of Scotland.